A shelter dog learns to relax in a home environment with the aid of a meal toy. Motivation is the key to positive reinforcement based training, and finding your dog's can be a real challenge in some cases. But in every healthy animal, the need to seek food is a primal driving force that we can harness as a currency. Many dogs are bottomless pits, literally eating themselves to discomfort and even danger when afforded the opportunity, but others simply stop when they're full. These dogs don't want more food, they want enough food, and that's actually a blessing for those of us forgetful enough to leave dangerous amounts of food out. These are the dogs we'll be talking about in this post, those frequently labeled "non food motivated" and considered potential candidates for aversion-based training. I recently worked with a shiba inu who was a classic example of a dog who was not ready to have the economy closed on food. Originally purchased from a pet store and already of a primitive breed, Makkuro was fearful in new situations, particularly without her family. Her first time away from home was not the appropriate time to close the economy on food. She would simply refuse to eat out of anxiety, even with no demands placed on her, so this was a time to simply let her adjust, come out of her shell, and eat whenever she felt safe enough to do so. It is important to note that we absolutely did not consider using aversive tools to take advantage of the dog's desire for safety. My goal was to help my friends in their journey toward a happy, mentally healthy dog before making obedience a priority, rather than establish the illusion of control prematurely at the expense of the dog's well-being. Makkuro has since blossomed into a prime candidate for a learn to earn programme in which every morsel of food is viewed as an opportunity for reinforcement. Our dogs arrive pre-programmed to work for their food, and this primal need doesn't vanish with the twice daily magical appearance of food in their dishes. Just ask anyone who has had an energetic adolescent puppy take it upon herself to redecorate while home alone! Most dogs enjoy keeping busy and winning prizes - if they didn't, then their ancestors wouldn't have lived long enough to create them! Giving dogs simple jobs, from puzzle feeders to obedience tasks, is a healthy, constructive way to fulfill their desire to work for their food. I've had several students express concern that their dogs don't eat the recommended amount of food and therefore should not have their intake limited. However, every dog whose owner has said this to me has had a body condition score in the overweight category: most dogs simply don't need to eat as much as what the bag says. The bottom line is that a healthy dog, who isn't too terrified or excited to eat, will not starve himself if regularly offered the chance to perform easy work, for the exact same amount of food he's been getting. In the case where the dog is essentially being free-fed, with food left out all day for her to nibble at until she's done, your dog is probably eating too much and very difficult to motivate with food. Try putting the food down for 10 minutes twice a day, and measure how much she actually eats. If she's not losing weight to an unhealthy degree, then this is probably how much she should be eating. Every time you give your dog free food, you've wasted an opportunity to help your dog learn to love coming when called, walking nicely on a leash, or otherwise engaging his mind. If you don't have time for a training session, then simply put his food into a puzzle feeder instead of a dish. If your dog is nibbling throughout the day, move to scheduled feedings, 10 minutes apiece. If you are spiking your dog's food, then stop. If your dog consistently eats other types of similar food but rejects her own for days, then it's possible that you have essentially trained your dog to avoid her food. In this case, consider switching foods to one she likes, but don't ever spike it. 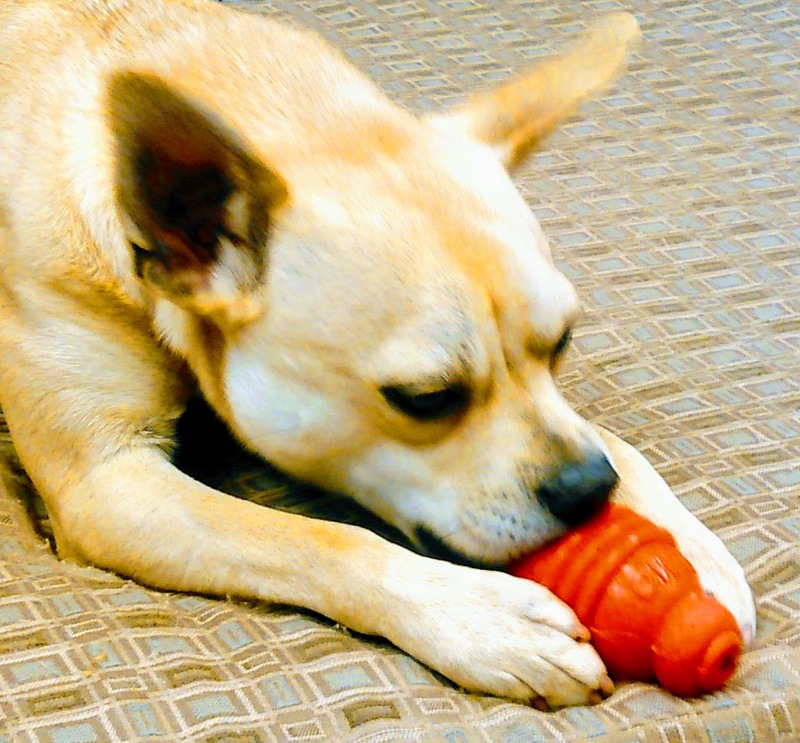 Once your dog is eating regularly from her dish, begin putting it into feeding toys. The easiest way to start is by filling a KONG with nothing but dry kibble. She'll be immediately rewarded just for interacting with the toy at all. Attention games: click when she looks at you, drop a single kibble in front of her or throw it for her to chase, and repeat as she will look back at you for more. Ping pong recalls: call the dog between family members who each hold a portion of her meal. Scatter recalls: a similar recall game for only one person, scatter a handful of kibble, hide, call her as she's finishing the kibble, scatter more kibble as her reward, and repeat. Now that your dog is used to working for her regular food inside the home, you're ready to reinforce manners in your everyday walks and outings. Play the same games on a long line outside, using diced ham, liver, dog food rolls, FreshPet refrigerated dog food, air-dried ZiwiPeak dog food, or other highly appetizing bite-sized morsels. As your dog becomes eager to work both inside the home and in public, you can begin to cut back from reinforcing every behaviour, to approximately every other, and so on, and you'll also be able to switch from high-value foods to other types of rewards, such as toys, engagement with you, and lower-value foods.